Phosphorous is a crucial mineral in the body that filters waste in the kidneys, promotes the growth and repair of tissues and cells, and aids in the development of strong teeth and bones. Luckily phosphorous is available in a variety of foods. 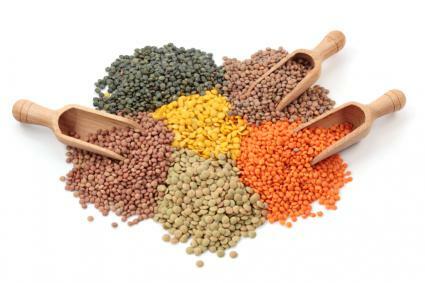 According to the United States Department of Agriculture, there are 178 milligrams of phosphorous in each serving of cooked lentils - or about a half-cup of the legumes. Each serving of beef liver contains a whopping 392 milligrams of phosphorous - or about 56 percent of the recommended dietary allowance for this nutrient, reports the Department of Veterans Affairs. One serving of beef liver is approximately three ounces of meat. While many types of seafood are high in phosphorous, the mineral is especially abundant in sardines. In fact, the United States Department of Agriculture notes that three ounces of sardines with bones - or about one serving - provide 417 milligrams of phosphorous. One serving - or a cup - of nonfat, evaporated milk provides 499 milligrams of phosphorous, reports the United States Department of Agriculture. Adults, then, can meet over 70 percent of the recommended dietary allowance for this nutrient by drinking a single serving. Depending on the specific type of yogurt, the amount of phosphorous found in one serving - or a cup - of the food may vary. While plain, skim yogurt provides 356 milligrams of phosphorous, that which is made with whole milk may only provide 215 milligrams of the mineral. This may be due to the protein content; according to the Department of Veterans Affairs, as protein level increases, phosphorous content also rises. While beans in general are high in phosphorous, northern beans are especially rich in the mineral. Each serving - or half-cup - of northern beans contain 178 milligrams of phosphorous, reports Self Nutrition Data. As with beans, potatoes in general contain high amounts of phosphorous. The Department of Veterans Affairs reports that while a half-cup serving of boiled and mashed potatoes provides 101 milligrams of phosphorous, one medium baked potato provides 141 milligrams of the same mineral. The addition of skin on baked potatoes - which is typically absent on mashed potatoes - likely contributes to increases in phosphorous content. Bran cereals such as All Bran may be a good choice for those who are interested in increasing their phosphorous intake. In fact, a half-cup serving of All Bran contains 357 milligrams of phosphorous, reports Self Nutrition Data, which is nearly half of the recommended dietary allowance for the mineral. A half-cup serving of instant chocolate pudding contains 338 milligrams of phosphorous, reports the United States Department of Agriculture. Those who have a craving for this chocolatey treat, but have been encouraged to keep phosphorous intake in check, may want to opt for homemade chocolate pudding, which only provides 120 milligrams of the mineral. One medium-sized avocado contains 105 milligrams of phosphorous, notes the Department of Veterans Affairs. While this is a fairly low amount when compared with other foods on the list, it is much higher in phosphorous than other fruits and vegetables. While some individuals want to increase their phosphorous intake, others may have been encouraged to reduce their consumption. No matter your specific goals, recognizing foods that are rich sources of phosphorous can be helpful when it comes to building and maintaining good health.